While most of our products cater towards early language development and social skills, do you know that we also offer educational materials for students who are developing academic skills and early reading? This week’s pick highlights our Reading Comprehension Practice Cards. These are ideal for practicing critical reading and auditory processing skills. 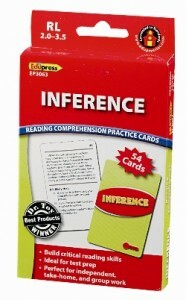 One deck focuses on Inference and the other on Cause & Effect. Each card consists of a leveled reading passage and a multiple-choice question that asks the student to infer meaning from the text. You can always adapt it for early or non-readers by reading the passages aloud and developing auditory processing skills. This week only, save 15% on the Inference and Cause & Effect Reading Practice Comprehension Cards by entering the Promo Code BLOGRC2 at checkout. *Offer expires on January 24, 2012 at 11:59 pm EST. Not compatible with any other offer. Be sure there are no spaces after the Promo Code when you enter it at checkout. Written by: Different Roads to Learning on January 17, 2012. This entry was posted in ABA, Academics, autism, Difflearn Promo Code, Pick of the Week, Products, Resources and tagged ABA, Applied Behavior Analysis, autism education, conversational skills, Different Roads to Learning, learning, Resources, teaching tools by Different Roads to Learning. Bookmark the permalink.